Figured takes your data security very seriously, which is why we have built some robust features to protect your account, including 256-bit encryption (the same as what the banks use) to keep your data safe. All Figured URLs start with an HTTPS address (which means Hypertext Transfer Protocol over Secure Socket Layer) and displays a padlock. This is used to indicate a secure connection. 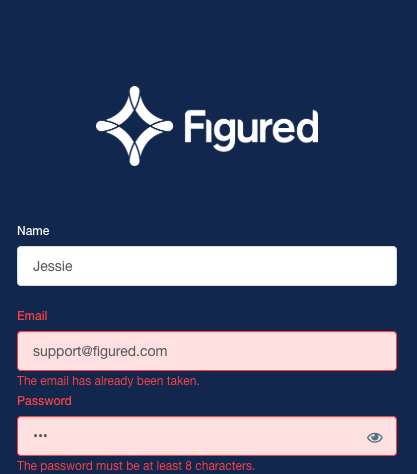 When logging into your account, if you’re working on a personal device, you’ve got the option to let the browser save your login details for future reference. If however you’re working on a shared device, please don’t save your login details. If your login credentials are wrong, an alert will appear. 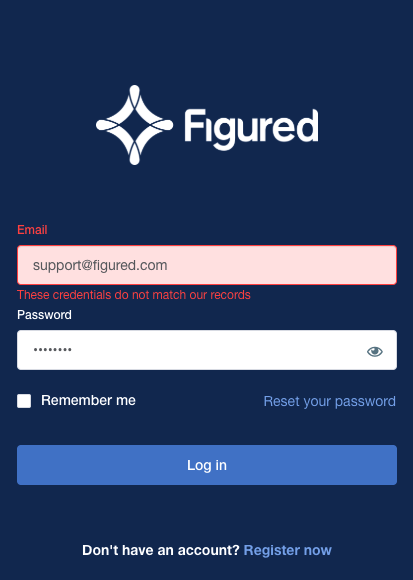 You can also enable two factor authentication for your Figured account which is an added layer of security, check out this article to set it up. When creating an account in Figured you’ll be asked for a password. This must be a minimum of 8 characters in length. If your password doesn’t meet the minimum requirements, an alert will appear to let you know what needs to be changed. If you need to reset your password, check out the article we've written on resetting that here. If you’ve been inactive in Figured for 60 minutes or more, you’ll be automatically timed out and a pop up message will appear. Click OK and you’ll be taken back to the login screen again.